One cold wintery Saturday in 1895, a group of people queued up at The Grand Cafe in Paris. They paid one franc to descend into the basement. There, was a collection of seats in a row and a large sheet. A Projector stood in front of the sheet. The Lumiere brothers hovered, nervously. These people were about to make history as the first audience at the first-ever commercial, public screening of moving images. Auguste and Louis Lumiere’s journey began many years earlier. The boys were always technically minded – They attended La Martiniere Lyon, a prestigious technical school. Their father set up a business making photographic plates. Working days were 5am to 11pm for Louis and his sister, (Auguste was away in the military). The business was close to bankruptcy for years. When Auguste came back, he and Louis put their heads together and used their technical know how to create a machine that would automate the process of plate creation. They even managed to come up with their own plate. They managed to turn the company around from Bankruptcy to a busy enterprise employing 12 people in just two years. In 1892, they started to move into moving pictures. The brothers patented their own cinematograph on 13 February 1895. 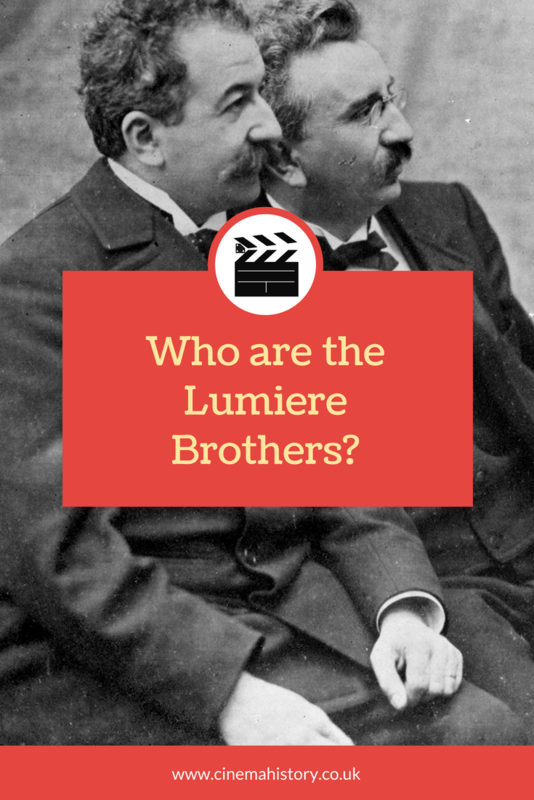 Once they had built a working version of their camera, the Lumiere Brothers needed something to film. Their first film was an “actuality” shot of their staff leaving the factory. The film, imaginatively named La Sortie de l’Usine Lumière à Lyon (Workers Leaving The Lumière Factory in Lyon), lasted for 46 seconds at 16 frames per second. It was the one of the first shown to a paying audience. Up until this point, paid screenings of films were using “peepshow” style booths, that could only accommodate one person at a time. Thomas Edison was making a tremendous amount of money with this system. The Lumiere Brothers’ system was special. The camera could turn into a projector, so film to be projected on to a sheet or a wall in front by a group of people – or, more importantly, lots of paying customers all at once. Throughout 1895, they held private screenings to show the technological advancements to people of power in the photography industry. On Saturday 28 December 1895, the Lumiere Brothers showed ten films to this paying audience. It went down a storm. People were fascinated with the idea that photographs could move. The Lumiere’s saw their chance to make money with this novelty. L’arrivée d’un Train en Gare de La Ciotat (The Arrival of a Train at La Ciotat Station) is probably their most well-known film. The brothers even created something that seems like the start of slapstick comedy, L’Arroseur arrosé (The Waterer Watered/The Sprinkler Sprinkled). Louis and Auguste never saw a future in silent film. After all, the most prominent reactions to their films were wonder that photos could move. Perhaps they thought that once the public knew how it worked, they would lose interest. For the rest of the Victorian era, moving pictures were often used as novelty sections in Music Halls or a side shows in carnivals. The Brothers’ declined to sell their camera to other filmmakers such as Georges Méliès. Piracy of films was rife in the early days of cinema by producers looking to make a quick buck. It is easy to see why the Brothers had no faith in their invention. Eventually, they dropped their film production to focus on creating a process for coloured photographs. Their inventions here were another massive success for them, and the Lumiere company remained at the top of the photography game until well after their deaths. Louis died on the 6 June 1948 at the age of 83, and Auguste passed away on 10 April 1954, aged 91. Both lived through the golden era of silent movies and to hear the introduction of sound in film. They lived through both world wars, which saw the use of film as propaganda and morale-boosting tools. Lumiere and Auguste lived long enough to see a movement they were part of becoming more than a novelty and pass into everyday life. Would movies have been different if they had carried on in the film industry? We’ll never know.